Keith Wade, Chief Economist & Strategist at Schroders, discusses three themes that will shape market performance in the coming year, as well as four events that could take investors by surprise. 2018 was a challenging year for investors with US equity and government bond markets both returning less than cash. Two factors were instrumental in delivering this outcome: disappointment with global growth and less cash flowing through the global economy (tighter liquidity). These factors will continue to influence markets in the year ahead. We have identified three key themes that will prove important for investors in 2019. We also discuss four “black swans” - events which are plausible but not currently being given much weight by markets. In 2019 we expect the volume of money in the global financial system to reduce. The main reason for this is a change in the activities of major central banks. After a period of buying government bonds, the US Federal Reserve (Fed) plans to now sell back some of these investments, withdrawing some cash in circulation. The European Central Bank has said it will stop buying bonds. This leaves the Bank of Japan as the only major central bank still contributing to new money to the financial system (through the purchase of its government bonds). This matters because when money is easily accessible, and available to borrow cheaply, investors are prepared to take greater risks. In recent years this has helped direct investment into peripheral eurozone markets (e.g. Greece, Portugal, Spain and Italy), some emerging markets and also lower grade corporate credit. As liquidity is withdrawn from the system, an important support for these markets disappears. The early effects of this trend were already being seen in emerging markets in 2018. In 2019 they look set to intensify. Given the above discussion it may seem odd but we believe that emerging markets can make a comeback in 2019 – if the US Fed’s policy of interest rate rises comes to a halt. Should this happen - and we forecast one more rate rise in June, taking US rates to 2.50-2.75% - there is good reason to believe the US dollar will lose some of its strength. This would provide a welcome relief to those investors that borrow in dollars –a heavy weight of whom reside in the emerging markets. The positive effects from this development could more than offset the pressure from the withdrawal of money in the global financial system and escalating trade tensions. Arguably, prices for emerging market assets may already be discounting the worst, with both equities and foreign exchange in those countries having fallen significantly so there is room, following some good news, for a bounce. Macroeconomic developments will be important as well though and it may need more government spending and/or tax cuts from China before investors’ confidence is more firmly restored. The worry of a US-China trade war remains a looming threat but there is no reason to expect an outright contraction in overall trade as activity should be diverted elsewhere. Without the engine of US or Chinese demand, global growth tends to slow. The US outperformed, in growth terms, in 2018 as a result of President Trump's tax cutting agenda. Other leaders and governments have been taking note. In France, President Macron responded to weekends of riots by meeting populist demands for lower taxes. In the event of a hard exit from the EU, the UK is planning its own fiscal boost. Japan may well be the exception, with an increase in a consumption tax scheduled for October 2019. However, even here measures are being taken to offset the impact. In any case, the key point is that governments seeking growth are no longer making economic reforms to increase competition or make labour markets more flexible. The approach today is to deliver a quick fix through a tax cut, increased public spending or regulation such as a rise in the minimum wage rate. Some of these measures are warranted and overdue but others are a response by governments to populist pressures. 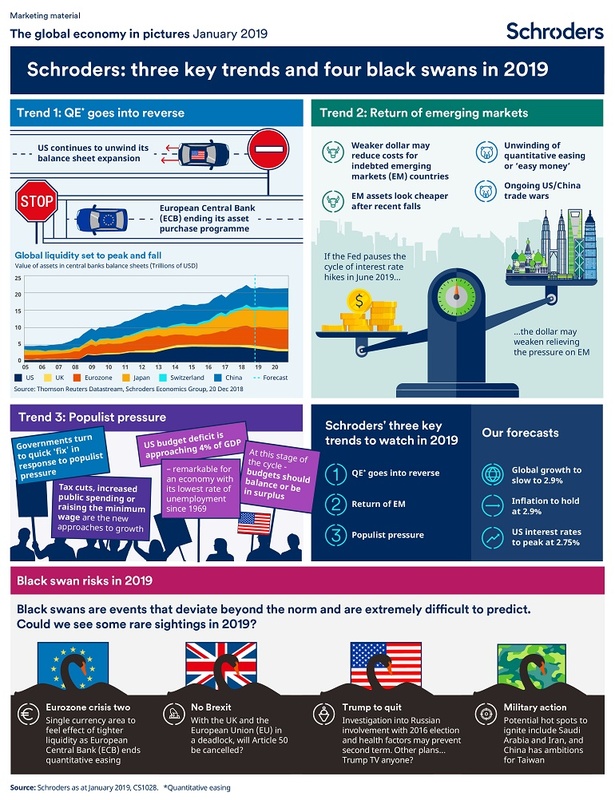 How are these themes likely to shape market performance in 2019? Much of the bad news is already priced in by the markets. This of course is no guarantee of positive returns in 2019 but it does mean that markets are better positioned for disappointment and hence potentially more resilient to shocks than they were last year. The themes above are reasonably well-known. Black swans are the “unknown unknowns”. By definition, we cannot anticipate them but we have identified four scenarios are plausible. We think they are also worth consideration. The first eurozone debt crisis began in 2009 and saw several eurozone member states (most notably Greece) become unable to repay (or refinance) their debts. A number of countries were also unable to bail out over-indebted banks. The European Central Bank (ECB) stepped in, effectively printing money to ensure the markets continued to have access to cash, thereby preventing a suspension in activity and possible economic collapse. Since then, there has been a call, from President Macron in particular, for the creation of a central fund to support growth should such events arise again. This has yet to be formed. A potential new crisis was only narrowly avoided at the end of 2018 when the spending plans of the new populist Italian coalition government tested the strict guidelines of the European Commission. Such drama is likely to play out again in 2019 given the broader rise of populist politics. This may seem inconceivable given the time and energy currently being poured into sorting a withdrawal agreement. However, “no Brexit” is the only outcome that will not require a vote (apart from "no deal"). As MPs have rejected the current deal on offer, and the EU unlikely to concede anything further, there must be a possibility that the government cancels Article 50 and stays in the EU. Sadly, there are plenty of hot spots which could ignite in 2019. The proxy war in the Middle East (being fought in Yemen and Syria) could become an actual war between Saudi Arabia and Iran. China has ambitions for Taiwan and across the region. The recent departure of defence secretary James Mattis indicates a more isolationist US, creating opportunities for others to fill the void. If President Trump’s dismissal of the UN’s function leads to a less co-ordinated international response to territorial skirmishes, Russian ambitions could re-escalate. Although it is often difficult to read the president's intentions, he appears to be constantly campaigning and setting himself for a second term. However, he will have to see off US Special Counsel Mueller’s investigation into alleged Russian interference in the 2016 election first. Furthermore, he is already the oldest person to be elected president, taking office at the age of 70 and would be 78 if he served a whole second term. Health may be a factor. Or, he could simply decide to do something else: there has been talk of him founding a media empire – Trump TV anyone? Da Indexanlagen immer beliebter werden, wird das Handelsvolumen rund um die Termine, zu denen Indizes neu gewichtet werden, zunehmend erhoeht. Das kann in der Folge zu unvorhersehbaren Kursschwankungen führen, so Howie Li und David Barron, beide Legal & General Investment Management. Indexfonds gelten häufig als die kostengünstigste und einfachste Art, um Marktengagement aufzubauen. Aber ihr Erfolg bei der Gewinnung von Anlagegeldern geht mit der Gefahr von Renditeschmälerungen für die Anleger einher, wenn die Mittelflüsse nicht proaktiv gemanagt werden. Legal & General Investment Management (LGIM) bietet diese Investmentlösungen seit mehr als 30 Jahren an und hat sich so zum fünftgrößten Indexmanager weltweit entwickelt.1 In dieser Zeit haben wir verschiedene Risiken und Ineffizienzen beobachtet, die wir zugunsten unserer Anleger auf pragmatische Weise mindern und aus denen wir für sie sogar Vorteile ziehen konnten. Da zum Beispiel die Anlagegelder, mit denen populäre marktkapitalgewichtete Indizes nachgebildet werden, im Laufe der Jahre zugenommen haben, sind laut unseren Studien immer mehr Anleger für die mit den Aktienkursen verbundenen Risiken rund um Neugewichtungsereignisse anfällig geworden. Diese Ineffizienzen dürften noch weiter zunehmen, da wir für beliebte, auf Kernaktien fokussierte Indizes von einer steigenden Kursvolatilität ausgehen, während immer mehr Anleger an Lösungen mit aus Kernaktien bestehenden Indizes interessiert sind. Aus diesem Grund sind wir bemüht, die Risiken, die mit extremen Handelsereignissen (o.ä) einhergehen, proaktiv zu meistern. Es ist kein Geheimnis, dass die Beliebtheit von Indexanlagen in den letzten Jahren explosionsartig gestiegen ist. Anleger interessieren sich für die vielen Vorteile von Indexfonds, darunter die vergleichsweise niedrigeren Gesamtkosten und den breiten Marktzugang. Die große Anzahl an Indexanlagen am Markt – insbesondere Anlagen, die beliebte, marktkapitalisierungsgewichtete Aktienindizes nachbilden – ist in den letzten zehn Jahren weiter gestiegen. Bank of America Merrill Lynch und Moody’s haben in Studien festgestellt, dass in den USA etwa 38 % aller Aktienanlagen in indexnachbildenden Fonds vorgenommen werden. Sie gehen davon aus, dass der Aktienfondsmarkt in den USA schon ab 2020 zur Hälfte auf aktive und zur Hälfte auf indexbasierte Anlagen entfallen wird. In absoluten Zahlen schätzt PwC, dass sich das verwaltete Vermögen in indexnachbildenden Anlagen 2016 auf 14 Billionen US$ belief. Bis 20252 wird sich diese Zahl laut PwC mehr als verdoppeln. Das Ziel der Indexfondsmanager besteht in erster Linie darin, die Indizes so genau wie möglich nachzubilden. Da jedoch Indexanlagen immer beliebter werden, ist die Kursvolatilität wegen der Transaktionen, die die zahlreichen Indexanleger rund um die Neugewichtungstermine vornehmen, gestiegen. Früher fielen diese Transaktionen kaum ins Gewicht. Wenn ein Indexanbieter sich entscheidet, eine Aktie in seinen Index aufzunehmen oder daraus zu entfernen, dann wird diese Entscheidung sowohl entsprechend der Regeln des jeweiligen Index getroffen als auch lange im Voraus öffentlich bekannt gegeben. Manager von Indexfonds, die Abbildung 1: Vermögen in Aktienindizes nachbildenden Fonds als %-Anteil des gesamten verwalteten Vermögens aller Aktienfonds die Übereinstimmungs-Differenz zwischen dem Fonds und dem Index auf ein Minimum beschränken möchten, werden diese Änderungen oft erst am letzten Tag vor der Umsetzung der Änderungen in ihren Transaktionen widerspiegeln, um sichsonahwiemöglichanihrenBenchmarksauszurichten. Wie es die Logik von Angebot und Nachfrage vorschreibt, gilt jedoch: Je mehr Nachfrage nach Transaktionen mit den gleichen Aktien – von denen es ein festes Angebot gibt – zu einem bestimmten Zeitpunkt besteht, desto höher ist die Wahrscheinlichkeit, dass der Kurs dieser Aktien vorübergehend steigt oder zumindest kurzfristig Schwankungen aufweist. Abgesehen von diesen Neugewichtungsterminen ist der Umschlag für Indexfonds in der Regel insgesamt recht niedrig. Im Mai 2018 führte eine umfangreiche Überprüfung eines Aktienindex zu folgendem Ergebnis. Rund 50 Aktien wurden neu aufgenommen bzw. schieden aus, was an einem einzigenTag eine Steigerung des Handelsvolumens um mehr als das 13-fache im Vergleich zum Vormonat nach sich zog. Unsere Schätzungen deuten darauf hin, dass je nach Index der dritte Freitag eines jeden Quartals oder der letzte Tag in den Monaten Mai und November das Handelsvolumen wesentlich durch umfangreiche Indexneugewichtungen bestimmt wird. Wir untersuchten den möglichen Unterschied auf die Performance bei Neugwichtung eines großen globalen Aktienindex wenn am Tag der Bekanntgabe gehandelt wird und nicht bis zum Datum der effektiven Neugewichtung ein paar Wochen später gewartet wird. Im Verlauf von 14 Neugewichtungen von Februar 2015 bis Mai 2018 hätten sich mit einer solchen Strategie laut unserem Research im Durchschnitt 6,5 Basispunkte an jährlicher Performance erzielen lassen. Anders gesagt verloren Anleger, die erst am Tag der Indexneugewichtung Transaktionen vornahmen, potenziell bis zu 6,5 Basispunkte an Performance. Sie hätten diesen Verlust aber eventuell verringern können, wenn sie das hohe Tradingvolumen an den Neugewichtungsterminen vermieden hätten. Research von Berkeley erläutert, weshalb dies unter Umständen der Fall ist: Viele der von ihnen untersuchten Aktien wurden sowohl nach der Ankündigung ihrer Aufnahme in Kernindizes als auch am Neugewichtungsdatum weit über ihrem durchschnittlichen Kursniveau gehandelt und gaben häufig einige dieser Zugewinne in den darauffolgenden Tagen wieder ab.2 Bei den einzelnen Unternehmen können diese Ereignisse im Vergleich zu den Tagen vor und nach der Neugewichtung zu einem äußerst sprunghaften Anstieg der Handelsvolumina führen, was sich natürlich auf die Kursvolatilität auswirkt. Die Nachbildung von Indizes, deren Neugewichtungen nicht an Tagen mit hohem. Tradingvolumen erfolgen oder die ganz einfach weniger Neugewichtungen vornehmen als andere Benchmarks, kann ebenfalls helfen, das mit unvorhersehbaren Kursschwankungen einhergehende Risikozumeiden.WieanhanddesNeugewichtungskalenders im Anhang ersichtlich wird, kann ein Index, der an einem anderen Zeitpunkt als dem Quartalsende neu gewichtet wird, die Massen meiden, die durch maßgebliche andere Indexanbieter mobilisiert werden. Anleger können nach wie vor einen breiten Marktzugang erhalten, wenn sie auf indexnachbildende Aktienfonds setzen, bei denen Neugewichtungen im Vergleich zu den beliebten Kernindizes in „ruhigeren“ Zeiten erfolgen. In unseren in Kernaktien investierenden Exchange Traded Funds (Core ETFs) verfolgen wir beispielsweise die Performance der von Solactive unabhängig verwalteten und berechneten Indizes. Bei Solactive aus Frankfurt am Main handelt es sich um einen globalen Marktführer in der Indexbranche mit mehr als zehn Jahren Erfahrung und Anlagen in Höhe von 200 Milliarden US$ in indexgebundenen Produkten (Stand: Januar 2018). Diese Indizes sind so konzipiert, dass sie neu gewichtet werden, bevor viele der maßgeblichen Indexanbieter Änderungen an ihren Indizes ankündigen. Trotzdem korrelieren sie unseren historischen Analysen zufolge zu 99,9 % mit vergleichbaren Benchmarks maßgeblicher globaler Indexanbieter. Natürlich geht es bei der Bewältigung der mit Indexanlagen verbundenen Ineffizienzen nicht nur darum, das Datum der Neugewichtung zu ändern. Das Management von Indexfonds hat den unglücklichen Zusatz „passiv“ erworben. Dabei ist es alles andere als das. Wir bei LGIM verfolgen einen pragmatischen Ansatz der Indexreplikation, der es uns ermöglicht, die Renditen der Anleger potenziell zu steigern, indem vorhersehbare Performancebelastungen gemindert werden. So kann unser erfahrenes, für das Management von Indexfonds zuständiges Team zum Beispiel versuchen, wahrscheinliche Indexänderungen vorwegzunehmen, oder optimale Handelsstrategien einsetzen, wenn es zu bestimmten Ereignissen in Unternehmen kommt. Je stärker sich die Anleger der Ineffizienzen einer „herkömmlichen“ Indexanlage bei Neugewichtungsereignissen bewusst werden, desto anspruchsvoller werden sie gegenüber ihren Indexfondsmanagern. Da die Beliebtheit indexnachbildender Anlagen so bald nicht nachlassen dürfte, liegt es unseres Erachtens an den Managern, die in dieser Publikation aufgeführten Risiken zu steuern, etwa durch Lösungen wie die Nachbildung von Indizes mit alternativen Neugewichtungsterminen. Darüber hinaus könnte eine pragmatischere Methode der Indexreplikation zur Minderung anderer Indexineffizienzen die Kosten für Anleger senken oder sogar die Renditen steigern. In unserer unlängst aufgelegten Palette an Core ETFs sind wir zugunsten unserer Kunden um beides bemüht und zeigen, dass die wachsende Anzahl an Indexanlegern mehr von ihren Indexfondsmanagern erwarten kann und sollte. Weitere Informationen sowie eine Auflistung der Termine für die Neugewichtung der wichtigsten Indixes finden Sie links im PDF. 1) Pensions & Investments; Umfrage unter den größten Indexmanagern 2018. David Barron ist Head of Index Equity and Factor-Based Investing. Er konzentriert sich auf die Bereiche Research und Strategie und führt außerdem das Team, das für Anlagen in Index-Aktien verantwortlich ist.